AMC Trails Blog: Kale and the Decatriathlon: Or, go big or go home. Kale and the Decatriathlon: Or, go big or go home. There is something about working in the outdoors that lends itself to endurance sports: ironman races, marathons, biathlons, triathlons, tough mudders, and beyond (dogsled races anybody?). Kale Poland, AMC Backcountry Caretaker of 2011, takes all that to a whole other level as an ultra endurance athlete. A few days ago he completed what’s known as a DECATRIATHALON! Yup. That’s the physical equivalent of doing ten triathlon competitions. This translates into 20 hours in a pool, grueling hours running and cycling, and more than anything else, a pure joy and love of the challenge races like this require. It is 14 days (or less) of constant physical competition, and very little sleep. When Kale interviewed for us for the caretaker position in the winter of 2011, he downplayed his interest and experience in endurance sports. It was only over the course of the season as a caretaker that we learned more about what kind of athlete Kale was (and also his humility at his own athletic gifts). He would ride his bike to and from Pinkham to the trailhead for Garfield, with his full pack of gear, and often he would beat the caretakers who had cars. He was a trail runner, an excellent trailworker. And, of course, he never really let on about his super athleticism (even during our annual MidSummer kickball game, although we did see his competitiveness manifest). He mentioned his interest in training for the deca-triathlon, and I personally could not (and still can not) fathom the physical challenge and rigor of such an event. 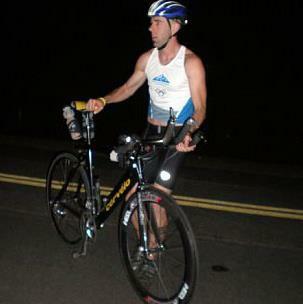 We are proud of Kale’s accomplishments as an endurance athlete. This year he was one of three competitors in this (insane) event, and is one of the few competitors under the age of 30 to have completed the event.